Whispers in the Loggia: For 100 Years, "The City's Voice"
However they've been interpreted over the years in some places, the Council documents state clearly that "in the Latin church the pipe organ is to be held in high esteem, for it is the traditional musical instrument which adds a wonderful splendor to the church's ceremonies and powerfully lifts up man's mind to God and to higher things." Originally built in smaller form for the 1904 World's Fair in St Louis and considerably enlarged on its acquisition by John Wanamaker, the "heroic instrument" still plays at least twice a day, for free, in the Center City temple where, come year's end, it shares the sanctuary with the beloved Light Show (albeit in the latter's botched, perhaps Masonic-inspired, Novus Ordo format). For the record, the Wanamaker isn't the only house organ marking a century this week -- today in Pittsburgh brings the opening of the annual Catholic (Old-)Media Convention, this year's celebrating the 100th anniversary of the Catholic Press Association on these shores... and in a special treat for the festivities, the "patron saint" of ecclesial newsrooms everywhere will be on hand to blow out the candles and cut the cake. Despite pronounced weakness and the ongoing effects of the leukemia that forced him to retire far earlier than he would've wished, John Cardinal Foley traveled west earlier today for what could be his valedictory appearance before his colleagues, and to receive another meaningful, impeccably-merited tribute as the association establishes a lifetime-achievement award named in his honor. To be sure, the 75 year-old "Voice" of Vatican Christmas for English-speakers worldwide isn't marking his own 100th this year -- and, in his inimitably kind but clear way, would be none too pleased if anyone thought he was. Still, while the words of Sacrosanctum concilium on the "instrument which adds a wonderful splendor to the church's ceremonies and powerfully lifts up man's mind to God and to higher things" were written in praise of the organ, in a uniquely human way, they serve well to describe "His Foleyness" and the instrument he's been over the decades -- most prominently as the the tour-guide to the faith for an unparalleled audience of billions... but all the more over a half-century of priesthood, as a friend, father, brother and support to a crowd can easily seem as large: a parade of friends one by one, spread across the globe and every walk of life. 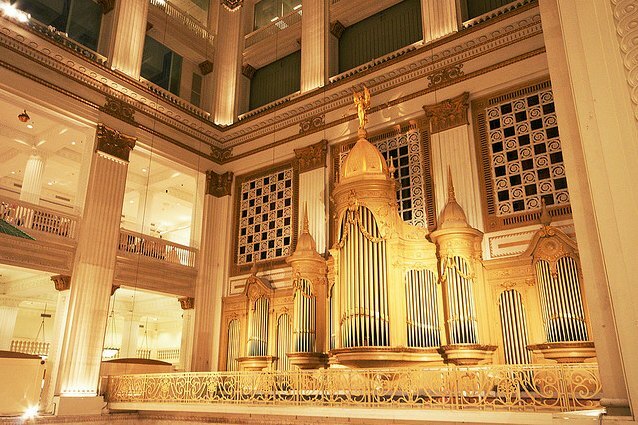 Over the years since 1911, the House That Wanamaker Built has come to see no shortage of other names adorn its pillars and the bags carried out of its doors (...Hecht's, anyone?). Even for the many changes of time and ownership, though, a very similar "voice" able to draw the masses and lift them with its gentle strength has ever remained its cherished heart. And so it is with this local church. In these weeks to come, all appearances are that another name not of this place will, as it were, be affixed to the venerable building, introduced with great fanfare before the judgment of the initially curious, instinctively suspicious city that ever passes outside. Yet step inside, and -- even if, as inevitably happens, some of the veteran floor-staff will be turned out and a new guard arrive, the budgets get overhauled, departments find themselves rearranged or consolidated, and the historic central core of display-counters are drastically slashed and spread apart -- the irreplaceable, beloved "heroic instrument" will stay the same as it's ever been. For the moment, the terms of sale still being written up, all eyes on an executive suite far from the old Boardroom upstairs, the distinctive feeling of edginess runs thick in the air: above all, for the clerks and customers on the floor, still holding on amid brutal times for a better day ahead... yet more than usual, the suspense running almost as high among their counterparts elsewhere, looking on in a way they hadn't in earlier deals for this fallen shrine as, whatever its shape, the handover being hammered out for it this time will serve as a significant indicator of the wider industry's outlook. Even against the backdrop of the clamor, though, the faithful, consistent "message" no management can change remains at the soaring center of the shop. And much as the anxious crew inside and a waiting city beyond might, at times, let their familiarity take its daily sound for granted, even now, if they let it, its voice recalls the Founder's enduring presence, keeps alive the same spirit that built the place and still moves it along... and tough as it can be while its future hangs in the balance elsewhere, offers a priceless shot of hope that everything will pan out for the best -- because, if nothing else, the house's latest crop of heirs have earned precisely that. Sure, these days around this town's most enduring sacred space (one considerably older than The Eagle) might have their challenges and then some, on an epic scale not known locally in centuries. Even so, though, wherever we might be on the map, let's never forget how blessed we are by the world-class instruments who, however unsung they might go on most days, play on in our midst, often thanks to the teamwork of the many pipes who make 'em up. And just as each of these have served to raise minds and hearts "to God and to higher things" in eras of light and darkness alike, so may they remain with us well along the road ahead, that they might ever more remind us of what's above, good and lasting... and above all, that from the inspiration they so freely and sweetly give day in and day out, the lot of us will ever seek and know the grace not just to listen, but to follow suit.